When I was first married, I lived far away from my family. This was way before cell phones and personal computers, so asking my mom for helpful tips was something I could only do occasionally. I was only 19 and I had never lived on my own before. To help expand my knowledge I would pour through cook books and recipes I found in magazines. I did know how to make quick meals my Mom had taught me and my Grandma Sorenson had taught me how to make chicken fried steak with her famous white country gravy. It’s hard to even remember there was a time when information was not at the tip of my fingers and that I couldn’t ask my Mom a question the moment that it would pop into my mind. I love the quick access we have to help and information, but there are great lessons I learned before the always connected, instant help and answers to every thought that goes through my head could be googled. 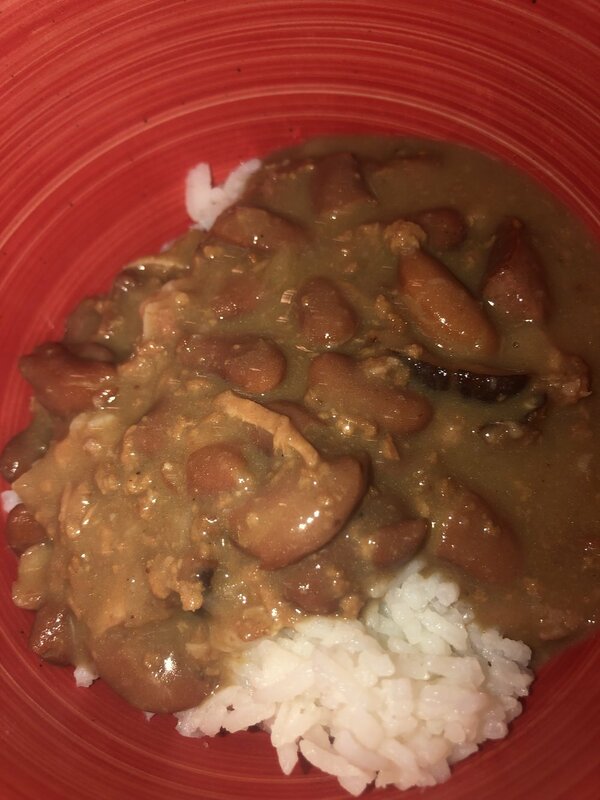 I remember the first time I tired to make red beans and rice. I was only 20, still a newly wed and eager to learn how to make my husband’s favorite meals. Since I am from the Northwest and he is from the South, there were many differences in the meals we had grown up eating. I had never had Red Beans and Rice before, but I looked it up in the index of my Betty Crocker cook book. I’m not sure what exactly went wrong, if I followed the directions accurately or not, but it is a moment that is burned into both of our memories. He remembers his very first bite, which turned out to also be his last. I remember being so excited to surprise him and cooking all day, only to be very disappointed in the outcome. I’m not even sure I cooked the beans long enough to ensure they were soft. I just did not understand cooking beans from scratch. I definitely didn’t know how to season them or give them that extra TLC they need to be the mouth-watering, hearty meal my husband was used to. One day, my Mother-in-law took pity on me and taught me how she made her, always requested, Red Beans & Rice. She invited me over to watch her make her pot of Red Beans. But since she never had a recipe or wrote it down, I grabbed something to write with and tried my best to document her process. Did I mention that she also didn’t measure! So, if you’re feeling adventurous and able to follow directions without precise measurement, clear your schedule and roll up your sleeves. You are in for some fun! If you’ve never made a roux before, get everything prepped and watch the video of how it’s done. You can totally do this. Soak the beans in water overnight. When you are ready to start the beans, drain off the water and set aside. Chop up the onion and the sausage; set aside. Place the pot on the stove, turning the burner to medium-high. Pour oil to cover bottom of the pot, about a 1/4 of an inch. Let the oil heat up. Flick a drop of water in the oil to make sure it’s hot enough… it should cause a slight sizzle. Then gradually add flour, stirring with a whisk until thickened like glue. Cook on medium-high until it turns light caramel color, stirring constantly so it does not burn. Add the onion; stir. Add the ground beef, stirring until browned. Add lots of garlic powder, pepper and salt… sprinkle back and forth across the pot 3x. Now add the ham bone, chopped sausage and the red beans to the pot and fill with water until almost to the top of pot… about 2 inches from the top to leave room to boil. Stir well. Add parsley flakes and a bit of sugar. Bring to a full boil. Stir well and reduce heat to medium low, with just enough heat to cause a very slight bubble. Put the lid on and simmer; stir the pot every thirty minutes to ensure the heat is high enough to cook but low enough not to burn. Cook 3-4 hours until the beans soften enough to smash 6 beans along the inside of the pot and stir. Simmer for one more hour. Serve over rice with a loaf of french bread. Serves 8-10. Camellia Red Beans are the only brand I use since my Mother-in-law swore it wouldn’t be the same with any other beans. She always sent me a healthy supply to have on hand before it was available where I lived or online. 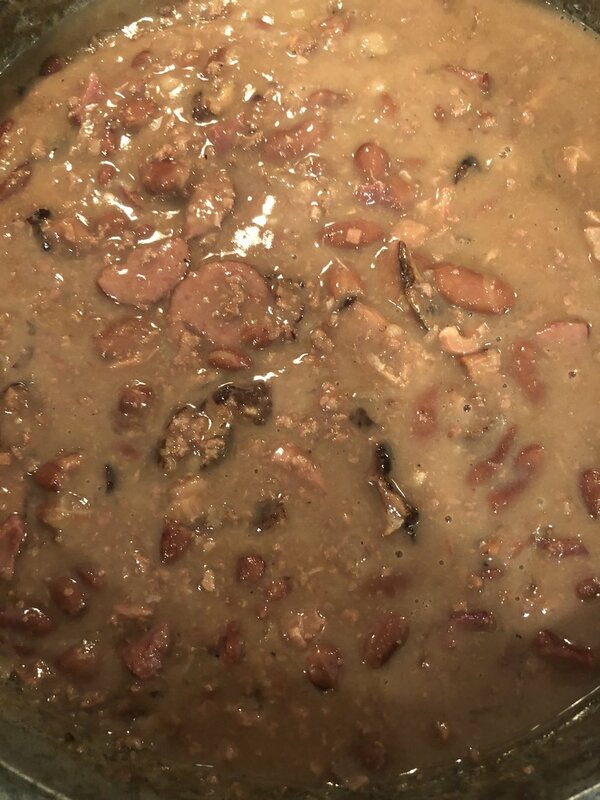 You can use any Red Beans you like but I have to follow how it’s always been done in our family! To make the rice without any effort, I use this multi-purpose Aroma Rice Cooker. I have found this one to be my favorite since it can also be used as a slow cooker and a steamer. 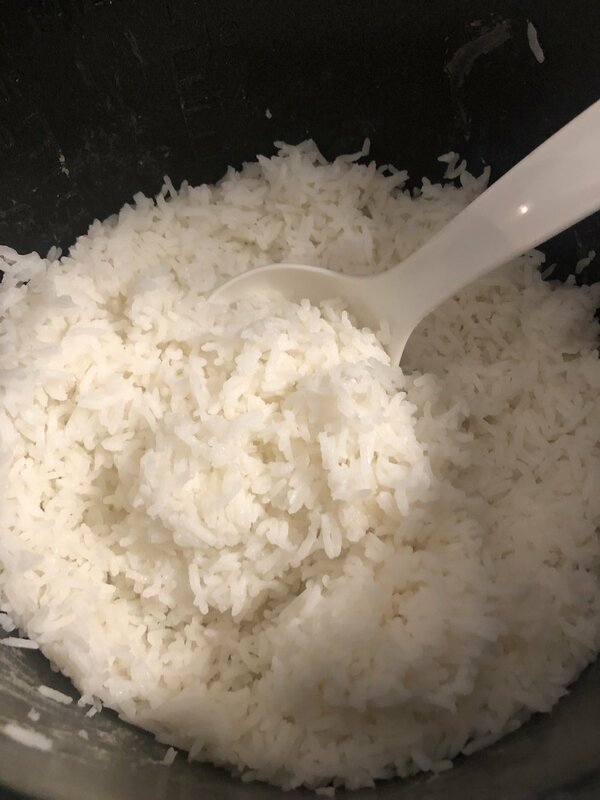 I do have an instapot but this is still my favorite for cooking rice. This is a great recipe for leftovers. My husband and his Mama say it’s best the next day when the flavor has time to mature, but I like it best the first day. I hope you enjoy your Red Beans & Rice adventure!